Turquoise is one of the oldest stones associated with jewelry. Across multiple cultures and beliefs, the stone with the beautiful blue hue has captivated people over millennia. Because of its cultural history and significance, the stone actually has many meanings. Despite the stone being used in jewelry across multiple cultures, there are some meanings that overlap and even come to mean the same thing. 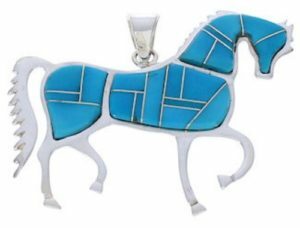 These meanings have become the most popular and remain one of the biggest reasons why people continue to wear turquoise jewelry. Because of the color of the stone, turquoise has been long associated with water and the healing properties that come with this element. The smooth surface is believed to heal and protect people from both physical and spiritual harm. In fact, evidence of Native Americans protecting burial sites with turquoise has been found as far back as 2,000 years. Some European Countries even dressed their horses in turquoise girdles to protect them during wars. This is actually how one of the most famous Native American pieces, the squash blossom, through Spanish traders. Another cool example is how ancient Chinese cultures believed turquoise helped align chakras and create balance in a person’s life. Turquoise can be seen on Chinese prayer beads, promise rings, and even on musical instruments, all symbols of harmony and enlightenment. You must see a recurring theme by now. The main thing to take away is turquoise is associated with healing and protection. Today, people wear the stone for fashion but the thought and mentality behind turquoise meanings still fascinate people to this day. Although the majority of cultures that believed in the healing power of turquoise are long gone, some still hold to the old belief. Some treated turquoise is smooth and cool to the touch, giving a relaxing sensation if you suffer from anxiety. Another good example of modern healing turquoise is simply the color itself. Experts believe blue calms people on a psychological level. Turquoise is everywhere you look, on every continent. It’s a natural resource that despite different thoughts and beliefs, all cultures have found beautiful or holy.